The Mystica II is the newest cartridge battery set from Airistech that sports a sleeker redesigned compact body and is designed to work with just about any cartridge you decide to use. It is manufactured with a wide 12mm cartridge port that will house some of the largest tanks on the market (Up to 11.5mm). 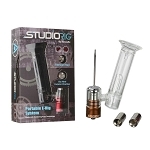 Airis also includes a short magnetic adapter ring and tall adapter to accommodate both 0.5mL/1.0mL cartridges. At only 1.5 inches long, 2 inches wide and just over 0.5 inches tall, the Mystica's new body is small enough for stealthy travel sessions anytime. It also now has a larger centered button that makes taking quick effortless hits much easier than before. The entire device is controlled using that button. Pressing it five times rapidly within two seconds will power the Mystica On/Off. After it is turned on your can press the button three more times to adjust the voltage output setting or two times to start the 15 second preheat cycle. There is an LED power light indicator that changes with the voltage output so you can always quickly see what you have set at a glance. 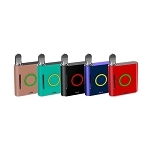 (3.4V Green, 3.7V Blue, 4.0V Red). This light also shows when you need to recharge with a flashing red light. 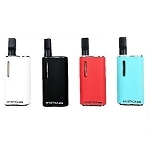 Airistech incorporates a premium 450mAh lithium-ion battery that will keep you going all day long so you won't have to worry about that happening too often. When it does connect to the USB cable and the LED shines red while charging and will turn off when complete. If you thought the Mystica Cartridge Battery was good before wait until you've tried the newest version. Grab your today in 6 colorful options. Add eDab Cartridge Refill Kit: Include above at a discounted price and receive a medical grade filling tool with interchangeable tips to cover all of your filling needs without the mess. Add Extra Magnetic Adapter: They are small and often easy to lose, grab an extra for cheap above and stay prepared for the worst. Great compact concealer! Wide 12mm opening takes the fat ~11.5mm carts currently all over the midwest. Super compact, and slick looking. Use the short magnetic adapter for 1ML carts. Only the mouthpiece sticks out of the unit, perfect for concealing and protecting your precious carts. All-around great unit. Well worth the upgrade to the model II, way to go Airistech. Fantastic product! I've been looking for something more compact and that can fit in my pocket. This does the trick plus has the same power as some of my bigger vapes. Definitely buying more in the future. NextDayVapes shipped it in no time and I had it under a week. Bookmarking this website to order again in the future. 2 points worth $2 will be earned when you buy this item.